Follow our pushchair safety tips to avoid accidents and injuries – from potential hazards with wheels, brakes and harnesses, to babies overheating in buggies. Watch the video above to see a step-by-step guide to safely placing and securing your baby into a pushchair seat. Although pushchairs are largely very safe, typically you'll rely on yours every day, so it will be subjected to a lot of wear and tear. We've been testing pushchairs for decades, so we know how find the best buggies that are also safe and durable for your baby. This includes identifying choking hazards and traps where fingers can get caught, as well as using special equipment to test handlebar strength and brake reliability. We even dangle a test dummy from the pushchair’s harness to make sure it’s strong enough to keep your baby secure in their seat. Pram charms - are they safe? A rickety pushchair that's prone to wobbling or tipping is an accident waiting to happen. Check for a wide, solid base, and get a feel for how the pushchair handles by testing it out in store and consulting our reviews. Even if you’ve got a stable pushchair, loading the handlebars with bags of shopping is asking for trouble, as it can cause the whole thing to topple. You should frequently inspect the wheels, as wobbly wheels can be a common issue, particularly if you’re using a stroller. Our survey of 2,000 parents in spring 2017 revealed that for 42% of parents, the wheels are the most common pushchair feature to develop a fault. A newborn baby needs to be in a pushchair seat that reclines to 150 degrees or more, to create a lie-flat position for him or her to travel in. Not all pushchairs recline to the right angle, and therefore aren't suitable to use from birth. Our tests check the angle of the back rest, so you can tell whether your little one will be supported as they grow. If you’re using a travel-system pushchair with a baby car seat on top, be aware that babies shouldn’t be confined to their car seats for longer than two hours, especially newborn and very young babies. This is because it can put a strain on your baby's spine and restrict airflow to their lungs, especially if the head has flopped forwards. 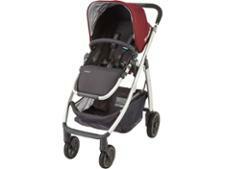 Pushchairs, travel systems and strollers all have maximum weight limits for the seat and the shopping basket. Our advice is to make sure you know what these are before nipping out with your baby, extra baggage, or even another child, in the pushchair. Not only can overloading lead to instability, it could also potentially cause your pushchair to break. You'll be able to find the weight limit in the instruction manual or in the technical specifications in our reviews. Ensure your brakes are effective and easy to apply. We’ve found that some pushchairs have brakes that are tricky to get to, or not clearly labelled, and all too easy to leave off by accident. Our tests check how well each model's brakes work, and highlight any issues where brakes are fiddly or tricky to use. Keep children well away from a pushchair when you're folding it or making any adjustments. One of the most common pushchair-related injuries occurs when little fingers get stuck in locking mechanisms or folding hinges. It's worth checking you’re able to fold and unfold it easily and smoothly, and lock it into place, to minimise the chance of an accident. Most pushchairs will have a five-point harness built in, to help keep your little one safe and secure. It’s important to use the harness every time your child is in the pushchair, and picking one with a harness that's simple to do up and undo will help. Ensure it fits snugly on your child so that they can’t wriggle around and get tangled or fall out. All pushchairs in the UK should carry a safety label confirming compliance with BS EN 1888:2012. If you can't see this in an obvious place, be wary. Certain models from big brands, including Mamas & Papas, Stokke and Uppababy, have been recalled in recent years because of safety hazards. Consult our list of pushchair recalls and safety notices to see if you own a potentially dangerous or faulty pushchair, and to find out what you can do about it. 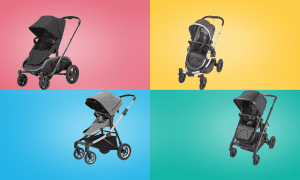 There are lots of buggy accessories out there, and you can see which ones we recommend in our guide to buying the best pushchair accessories. 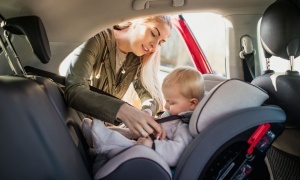 Some provide a useful function (for example a cup holder or a buggy board), but others can be a safety risk (such as pram charms or a faux-fur hood trim). Carefully consider any accessories before attaching them to your pushchair, and make sure that nothing with small parts is within reach of your child, as they can be a choking hazard. Some parents cover their pushchair with material to shade their child from the sun and harmful UV rays, but experts warn that covering a pram can cause your baby to overheat – increasing the chance of sudden infant death syndrome (SIDS). We conducted our own test examining how various materials affect the temperature within the seat area, to see what's best to use to shield your baby from the sun on a hot summer’s day. In general we advise against keeping babies out in the sun for too long. Babies can't sweat, so they can often suffer heatstroke much more quickly than an older child or an adult. Babies can also get dehydrated more quickly. Regardless of what you’re covering your pushchair with, you should never leave your child in a covered pushchair without constant checking and supervision. 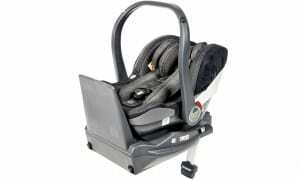 A buggy board is a board on wheels that attaches to the back of your pushchair for your toddler to ride on. Certain pushchair manufacturers make their own brand of ride-on toddler boards, but there's also a specific brand called Buggy Board. Whatever the type, if you’re using one of these ride-on platforms on the back of your pushchair, follow the safety instructions carefully. Ensure the board is securely attached to the pushchair and that it can withstand the weight of the toddler on it. Make sure the child is always holding on to the handlebars when riding on the buggy board. And also check that using the ride-on board won't affect your pushchair's warranty. Pram charms are decorations that clip on to the hood of a pushchair. But, as with anything hanging close to a baby or child, there’s a risk that they could end up as a choking hazard if your baby gets hold of one and puts it in their mouth. For this reason, we'd advise against using them. Read more about pram charms and other baby accessories we'd recommend avoiding. When we surveyed hundreds of pushchair owners in spring 2017 about the faults they’d experienced with their pushchairs, the top three were wheels, brakes and folding mechanisms – all of which could pose safety risks if they malfunction. If your pushchair develops a fault, you might be able to get your money back. Check our consumer rights advice on how to complain about a faulty pushchair. It’s good practice to inspect your pushchair for any safety hazards every few months, and make sure the brakes are still working well. If you’ve got a second-hand pushchair, this upkeep is even more important. Check the wheels are still correctly aligned and that there isn’t any bad wear and tear (such as rusting, flaking paint or ripped fabric). To double-check the harness is working as well as it should be, give it a good tug once it's done up around your child before you set off. Find out more about second-hand pushchair safety. 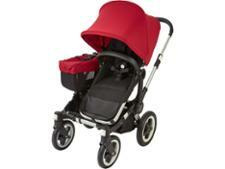 Do sun covers cause pushchairs to overheat? The NHS advises keeping babies under six months completely out of direct sunlight, and recommends that parents protect young children’s skin from the sun when UV levels are high. While putting a blanket or towel, or even a muslin cloth, over your pram might seem like an easy way to shield your baby from the sun on a hot summer’s day, experts warn that covering a pram can cause your baby to overheat. This increases the chance of sudden infant death syndrome (SIDS). But without a shade or cover, your child is left vulnerable to harmful UV rays and sunburn. We tested to see whether the temperature inside a pushchair rises when the pushchair is covered up with a range of materials, and whether the temperature rises to the point where there’s cause for concern. We did our testing on a very hot day. The temperature at the start of our test was 33°C, and increased to 34.8°C. Our test compared five different types of cover – a muslin, a towel, a fleece blanket, a Koo-di sun/sleep cover and a SnoozeShade – and a pushchair with the hood up, for one hour. We recorded the temperature at the start and then every 10 minutes behind each cover within the pushchair's seat area. 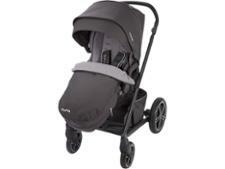 We used identical pushchairs for each cover, and set up the seat to be parent-facing, with the hood catching the sun. As you can see from the chart below, all the cover types that we tested showed an increase in temperature within the seat area from the moment we added them. The interior of the pushchair with the hood extended fully showed the smallest increase in temperature, but we'd expect this, as it wasn't fully covered. This was followed by the pushchair covered with the SnoozeShade. The interior of the pushchair covered with the towel became the hottest – nearly 6°C more than the one with the sunshade. Ultimately, what our test shows is that whatever cover you use, it's going to make the temperature inside the pushchair increase immediately. And if you leave your child in a covered pushchair in the sun over time, the temperature inside will continue to go up. But, of course, we know that mums swear by pushchair covers for blocking out the light and helping babies to sleep in their buggies during the day, and that specially designed products, such as the SnoozeShade we used in our test, have also been designed to protect babies from UVA and UVB rays. Indeed, using a sunshade responsibly can be safer than not using one at all. Check your baby regularly to see if he or she is too hot. Feel the baby’s tummy or the back of their neck (your baby’s hands and feet will usually be cooler, which is normal). If your baby’s skin is hot or sweaty, then this means they are too hot.